It does seem that they’ve developed some hybrid LTO/Capacitor solution that allows for longer lifetime and cycles. They have not provided me with any evidence to proove cycle life except for a reference from two of our big telecoms that have procured and tested them extensively and they are continuing with the rollout. At the pricepoint this looks like better value than other quoted GEL and Lithion-Ion options I’ve recieved. 48x 100Ah GEL in 48V configuration is more expensive than 3x 3.55kWh Sirius modules. Is it possible that they can extend the battery life by leveraging capacitor capabilities in a hybrid config? If I get 5000-10000 cycles at this price I’ll be happy with the value? If they cost twice as much as an LFP battery of equivalent capacity, you might as well buy a LFP battery of twice the size and get 4 x the cycle life (of an LFP battery half the size). They have not provided me with any evidence ..
All of the evidence provided to date indicates that the individual storage devices are LTO cells. We've seen zero evidence that any supercapacitors are present. LTO cells seem a reasonable technology, but you should note carefully @weber's post above regarding cycle life and temperature. It does seem that they’ve developed some hybrid LTO/Capacitor solution that allows for longer lifetime and cycles. No. There's no evidence of that whatsoever, and considerable evidence that they are simply LTO batteries. They have not provided me with any evidence to proove cycle life except for a reference from two of our big telecoms that have procured and tested them extensively and they are continuing with the rollout. Exactly what form does that reference take? Can you post it? Is it possible that they can extend the battery life by leveraging capacitor capabilities in a hybrid config? No. The module is limited to a 2C (half hour) charge and discharge rate by its control electronics and its warranty. At those rates, parallel supercapacitors would have no effect whatsoever. And there simply isn't enough room in the case to fit any significant amount of supercapacitors in addition to the LTOs required to explain the storage capacity. If I get 5000-10000 cycles at this price I’ll be happy with the value? When I gave typical lifetimes for LTOs above, those were for manufacturers with some kind of honesty and decency, who were prepared to put their name on their devices. Who knows what floor-sweepings you'd be getting in these no-name LTOs that don't even admit they are LTOs. And please consider the message you'd be sending to these lying bastards if you reward them by buying their product. What should I be paying before taxes per kWh capacity for an LFP battery (LifePo4)? Pricing here in SA seems in line with the Sirius units? The going rate for LFP cells in Western Australia seems to be about AUD$580/kWh. Excluding BMS that is. That's one way of putting it I guess. Yup still sceptical. Early adoption is very risky in this regard. A capacitor is a cylindrical water tower. A battery is a dam up in the hills. "What has he been smoking?" I hear you ask. Don't worry. I'll explain. I see a lot of people saying that we won't be sure whether Kilowatt Labs' Sirius devices are supercapacitors or batteries until we have "independent tests". I'm all for more tests, but what more trustworthy data could you have, than data that shows the exact opposite of what the tester dearly hoped it would show? I suspect that people who are still waiting for independent tests may be people who don't have the electrical training to be able to tell whether the data shows a capacitor or a battery, and that's perfectly understandable. If that's you, I suspect you might be just as happy if some authority that you trust, looked at the existing data and told you what it shows. Maybe, for whatever reason, you don't trust me, or the other engineers that have posted the same conclusion, or the dozens of other engineers reading this thread who have not disputed it. So I'm going to try to turn you into your own trusted authority on the matter. It's not really that hard to understand. The time-tested way of understanding electricity is via the water analogy, where a wire is like a pipe and a quantity of electric charge is like a volume of water. Let's make one "coulomb" correspond to one cubic metre (1000 litres) of water. Like all analogies it has its limitations, but we won't be going anywhere near them in understanding the difference between capacitors and batteries. The analogy is nearly perfect for this purpose. Electrical "current" is just what it sounds like—a rate of flow. One amp of electrical current is one coulomb of charge per second, so that's like one cubic metre of water per second going through a pipe. We could call a flow rate of one cubic metre per second a "water-amp". Electrical voltage is like water pressure. Thanks to gravity, water pressure increases proportional to height. Specifically the height of the water surface above the ground level where we're measuring the pressure. So we could say that one volt is like one metre in height. However we're dealing with only 2.7 volts here, so I'm going to make one volt correspond to 10 metres in height, to make for more realistic water reservoirs. The term "ground" has the same meaning in both domains, as the reference point for measurements of pressure. A power supply is like a pump. The electrical storage device is charged from empty using a constant current of 3 amps from a power supply. We see the voltage increasing with time. The test is stopped when the voltage reaches 2.7 volts. It takes about 20 minutes (1200 seconds). The water reservoir is filled from empty using a constant flow rate of 3 cubic metres per second from a pump. We see the height of the water increasing with time. The test is stopped when it reaches 27 metres. It takes about 20 minutes (1200 seconds). Imagine that your city council has paid for a water tower, because you've been told that water towers have magical properties compared to dams. But the company that built it won't let anyone see it. Your mission, should you choose to accept it, is to figure out whether the reservoir is a water tower or a raised dam, based only on a graph showing how the water height (as measured by a pressure gauge at the pump) varies with time. How would you expect the water height to change with time if this was a cylindrical water tower standing on the ground beside the pump? How would you expect the water height to change with time if this was a dam up in the hills, with a pipe running up to its lowest point? Lets say its lowest point is 21 metres above the pump. Of course the area of the dam reservoir is much greater than the area of the base of the water-tower. Let's say that you have reason to suspect that the sides of the dam reservoir are vertical from 27 metres height down to 25 metres height and then they slope inward to the pipe opening at 21 metres. What would the graph of water-height versus time look like in each case, given a constant flow-rate and assuming they both have the same volume and both fill to 27 metres in 20 minutes? 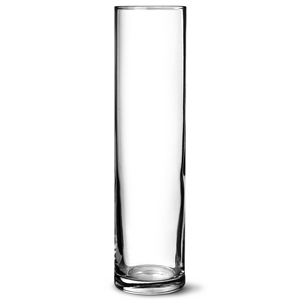 A capacitor is a cocktail glass. A battery is a champagne coupe. I assume you've figured out that, given a constant flow rate from the pump, the height of the water in the tower will increase at a constant rate. So the graph will be a straight line, like this. The rate at which the water level rises (and so the steepness of the line on the graph) depends on the flow rate and the horizontal area of the tower. A skinny tower would fill sooner and so would have a steeper line on the graph. So you can see it's like chalk and cheese. But why should you believe me when I say, in this voltage-equals-water-height analogy, that a capacitor is like a water tower and a battery is like a dam in the hills? I encourage you to do your own google searches, looking for authoritative sources. But to save you the trouble, here's confirmation for the capacitor analogy, from no less than the Department of Electrical Engineering at the University of Pennsylvania. It also shows the straight-line graph. Finding confirmation for the battery analogy is more difficult. Most uses of the water analogy don't treat batteries in any detail and simply say they are like a pump. If that was the case, they would never run out of charge! But you can readily find that the voltage versus time curves for batteries under constant-current charge look very much like the raised-dam graph above, and nothing like the water-tower/capacitor graph. However, I'm not only claiming that the Sirius devices are batteries. I'm claiming they are a very specific type of battery—a lithium titanate battery. So let's look at some voltage curves for those. These curves come from an EETimes magazine article. Now let's look at the graph from Paul Wilson's constant-current charge test of a Sirius device. Note that the legend below tells us the blue curve is the voltage curve. I've scaled it so its full storage capacity aligns with that on the graph above. You can right-click and chose "View image" to enlarge it. Or you can see it in the original video. We're interested in the constant-current part, which lasts until 1170 seconds. After that the current was turned down. You can see that, up to that point, the blue curve on this graph would fit neatly between the red and green curves on the graph above. In any case, you can see that it is nothing like the straight diagonal line of a supercapacitor. I rest my case. Any questions? So these will have a cycle life of between 7000 to 20000? They will never reach their defined warranty claim. This might be quite a ponzy scheme if it is true! Yeah pretty much what I said on the first page. So typical use for this product is one charge/discharge cycle per day. 10 year warranty is 3650 cycles. So LTO's will easliy do 10x that. So the cycle life will never be reached. Only the 10 year life could be questioned. That's 10 years to dissolve the company and disappear with your money. The plan was to install 200 of these systems in VIC using Government grant money. But no one has come forward yet to say they have one of these installed under the scheme. Forget that they aren't caps as an energy storage system is doesn't appear too bad. Do you feel scammed that they aren't caps or ok that they still do the job? There are too many inconsistencies with the alternative hypothesis, that these are just LTO batteries.
" ... These are "LiPo" drone batteries. Lithium-cobalt-oxide pouch cells. ..."
" ... I confidently predict you will find enough high-rate "LiPo" cells (lithium cobalt-oxide pouch cells) to explain more than 90% of its capabilities, ... "
" ... I don't think you will find LTOs in it. They are too expensive and too low in specific energy. I predict LCOs (which are cheap and have more than twice the specific energy claimed for the Sirius device) ... "
" ... We’ve already 100% cycle tested for 3000 cycles at 1.5C, 14 cycles per day, and the test is still going. ... "
" ... As far as I'm concerned, we've totally solved how it's being done. Namely, by using lithium-ion electrochemical cells. It's up to you to prove otherwise. ... "
" ... The super capacitor in the picture is one of the range of super capacitors, not the one in the 3.55kWh unit. ... "
" ... They are lithium titanate (LTO) batteries. Here they are: LTO1865battery.png ... "
You can see that in 1000 qty they are USD 2.0 for a 3.12 Wh device. That's about AUD 0.85 per Wh. ... "
" ... I note that for an LTO battery, the temperature required to produce thermal runaway, and the rate of heat generation when it occurs, give it about the same fire danger as an LFP battery, ... "
15-LTO cannot he charged at constant energy rate to full, ... This has been shown already in SOC graphs. 16. LTO is a flammable cell, ... "
" ... but we can still see how mild the LTO fire is in comparison to the LCO. ... "
" ... I should have explained that the electrolyte is absorbed into the graphene ... "
" ... I have to admit I was surprised that your venting cell was self-extinguishing, ... "
" ... the area of the graphene in acres rather than square meters (5 acres per cell, ... if true the manufacturing process must be very cheap ... "
" ... i.e. Get some white-on-red stickers made with the word "TITANATE" (to stick over the word "CAPACITOR"). ... "
" ... if it was an LTO cell, I wouldn't use it again after taking it that low. ... "
" ... And here is a constant current charge of the super capacitor https://youtu.be/7qSNG7nUQbQ ... "
1. ... the blow torch test shows that the electrolyte coming from the super capacitor only burns when a flame is held to it. So it’s a non-flammable electrolyte. 8. The super capacitor modules do not get hot when charged and discharged at very high rates such as 20 mins to full and empty. 9. When charging we have show a linear charge rate to full on the super capacitor modules. 10. There is no equalising required when charging the super capacitors to full which would be required with electrochemical cells. 14. Yes, we understand that the shape of the charge curve is different to a traditional capacitor, but it’s also different to a traditional lithium ion battery. ... "
" ... 1200 cells in series and parallel. We can parallel the modules almost indefinitely. ... "
"Can you get 2.7V LTO cells? If you can what are the cost per cell? What are the normal costs of 2.4V LTO cells?" " ... Alibaba has them for $1 each in quantity: https://www.alibaba.com/product-detail/ ... 33315JmI4I ... "
" ... The price you stated of $1/cell is actually advertised as $1 - $30 on Alibaba. At the quoted price of usd$2.5 per cell or aud $3.30, the Supercaps unit would then have $4,000 worth of cells in it at factory price and is being sold as a finished unit for $3,550 ... "
" ... You may get away with discharging a lithium ion battery cell to zero volts several times. It's like playing Russian roulette. ..."
Thats almost $2800 just for the cells. Those cells also have a maximum charge of 5A which has already shown a charge of 10A. ... "
" ... Product verified by factory visit at Kilowattlabs. Both inside and outside verified. No stickers on internals. ... "
" ... Given all of that, why would anyone conclude anything other than that these are the readily available, cheap LTO cells? ... "
" ... Your latest test only confirms what we already knew. That your device does not behave at all like a capacitor, but behaves exactly like a lithium titanate battery. ... "
On and on, yet each of the prior ~3,000 cycles are claimed to be empty to full, back to empty again, for thousands of times, with no noticable performance degradation, according to Arvio. And many more since. Bottom line is that no skeptic here has seriously taken up Arvio's offer to inspect and measure directly. Given the many inconsistencies listed I reject this prevailing hypothesis that these are LTO cells. So you have access to a single cell we can submit for elemental analysis? That would confirm unequivocally that it is, or isn't what is claimed. Sigh. That sounds like the "smoking controversy" that the tobacco industry used for many years. That was Weber's initial guess, when we all had very little information. Ok, that's the best evidence on the side of supercapacitors. But we only have the manufacturer's word that the cycles are really going down to zero volts every day, and that there is no significant degradation of performace, particularly storage capacity (apparent Ah). LTOs are supposed to last 10,000 cycles or so, so the degradation at 3,000 cycles would be modest, especially if they're not really going down to zero volts. Perhaps there is electronics in the Arvio box that saves the batteries from total discharge. And that still stands. I remind you that LTO (Lithium Titanite Oxide) is a form of lithium-ion battery. It has lithium, and it uses ions to store energy. This is a claim, no proof at all. This is Weber's modified claim, given the extra information. That was nearly half way through the currently 11 page thread. At AU$0.85 per Wh, that would be around AU$3000 for the batteries. These would be by far the biggest part of the cost. I've seen figures of around $3500 and $4000 for the whole thing. Prices for components like that vary a lot, especially with volume, so I don't see that as unreasonable. And this has been born out in the videos, has it not? This is not an indication of supercapacitors. Why not? I haven't used LTO, but I can't see any pertinent difference with other lithium chemistries, which are all used in series for higher voltages. Indeed, there was a version of the iMiEV (available from Japan only) that used LTO cells, so that's an over 300 V pack. Sure. But it hasn't been proven that the charge/discharge rate is symmetrical. I don't even know how you'd demonstrate that without a long, expensive test over thousands of hours. Sure. But these batteries don't see any high rate charges (high rate for LTO is some 10C, which would be some 700 A for the total unit, or 13 A for one cell). Again, you are not giving them routine high rates of charge and discharge. So the degradation would be slow. And this has been shown in one of the the videos. This only proves that Weber's original guess of LCO was incorrect. His updated claim of LTO is consistent with the videos. This is an unsubstantiated claim. Where is the proof, or even an indication, of the presence of graphene? I don't see a lively market for used cells from the test lab This just means that the battery cells are being abused in the tests. You can get away with a few tests like those when the cells are new, but don't expect them to have normal life after such abuse. Again, we only have Supercap's word that the cells are being routinely discharged to zero volts. Perhaps he is taking the front terminals to zero volts, but electronics inside is saving the cells somehow, perhaps with a large MOSFET disconnecting the terminals from the cells. Again, only his word, and he won't tell us what the electronics is doing. Every video is consistent with LTO cells. Cost of cells depends on many things. A manufacturer might have had a large order cancelled, and needs to get rid of inventory at a good price. Exactly! In the high rate charge test, the cells reached some 70°C. That's a good indication that these cells are not supercapacitors. Lithium cells don't equalise, it's more like an absorb phase. But you only need that if you are charging to full capacity. You likely only charge to about 90% of rated capacity, and add a few more cells to compensate. There is other electronics in the Arvio box, which Supercaps won't tell us about. That seems like a BMS to me. No, it's exactly what we'd expect from a lithium ion battery, specifically a lithium titanate oxide battery. What's your point? All capacitors and batteries can be paralleled. So yes, you can have an LTO cell at 2.7 V.
With Russian Roulette, you don't get killed every time. With a video, if it turns out badly and a cell burts into flame, you can erase that video and try again until you find one that holds up. So the fact that you can do this once or twice means nothing. I've dealt with these issues already. Both comments are supporting LTO. On and on, yet each of the prior ~3,000 cycles are claimed to be empty to full, back to empty again, for thousands of times, with no noticable performance degradation, according to Arvio. Bottom line is that no skeptic here has seriously taken up Arvio's offer to inspect and measure directly. I think our side has shown that we don't need to try harder at all. The LTO hypothesis remains the best fit to the available data. The "inconsistencies" amount to Supercap's claims being inconsistent with the data, most of which he has provided himself. First, 'reecho'. Really? Some one who takes the time to read and think it through and comment to point out inconsistencies is a 'troll'? Actually that's the conversation, what you are doing however is more in line with trolling and not a useful part of a conversation of the topic. Spare me that please. I'm a casual reader of the topic, as it's interesting to me, there are graphine caps of this ballpark performance currently approaching production so it's quite a claim and counter claim being made of Kilowatt Labs, and about AEVA, and by others that are like-minded, boldly implicating and smearing Arvio in the process. Which does not seem right or proper to me given the paucity of substance in this AEVA zeitgeist and claim-relay. So I expressed those observations above in the interests of reviewing the discussion and pointing out that this is far from settled, or even puts enough meat on bones of the hypothesis, yet. And in Coulomb's retort I again see a lot of similar inconsistencies. Plus a whole lot of coulds, maybes, perhaps's and mights. Too speculative, too insubstantial, too reliant on a web of international conspiracies to deceive. It's mildly insulting to expect people to accept that stuff as a first-resort in such a critical discussion. Evidence is the first-resort, the rest is unhelpful and improper. Frankly, would Kilowatt Labs and its several affiliated companies pull this sort of alleged scam? Not very likely, given their history of commercial developments of other related products. And they could not hope to succeed unchallenged, nor to make much money out of it, plus it would besmirch everything else they ever do, and the people we know to be behind those companies. I can't see it, the payoff would be too small and too prone to fail early. So these accusations don't seem reasonable to make without rock-solid material evidence, of which there is still none. I'm also struck by the level of suspicion and conspiracy accusations, and implied or actually claimed dishonesty with regard to Arvio which may be warranted at a quiet-suspicion level, but the repeated accusation of deliberate and complex misleading, is, I think, quite a ludicrous proposition, on the face of things, and given the way Arvio has replied, so far. I can't see the deception others claim. So this is an over-the-top accusation which remains unjustified up to this point. This is important. These companies and the people involved in them can be very unfairly damaged plus smeared, professionally and financially. It seems none of the more vocal critics must have run a small business, as if they had, they would be acutely aware of this and avoid it. Commentators should be much more considerate of that, and circumspect, until there's solid evidence of a deception. Currently there isn't any, so no justification exists for these sorts of accusations being voiced as proxy-fact. It's too late now, but I think the moderation at AEVA (and other sites) could have done a more responsible job of avoiding allowing people to make what can turn out to be damaging false claims about Arvio, and others selling the Kilowatt Labs product. I hope that's not the AEVA standard for the future, but given the lack of hesitation to accuse in this case, it looks like it already is. At least the product 'Review' performed by solar-quotes made sure not to cross that line, and that should have been the standard to follow, until there's direct evidence of deliberate wrong. So, yes, this is not good enough--try harder. Time to make it 'convenient' to obtain definitive material confirmation or falsification. I'm going back to lurking to see what you get and observe the operative ethos--both will matter. All we're saying is that this energy storage device has all the hallmarks of a lithium titanate battery, and none of the hallmarks of a capacitor (super, ultra or otherwise). We've outlined on numerous occasions that the device is almost certainly a LTO battery, and Arvio's own experiments simply reinforce this. Until Paul sends us one of the cells from a module for elemental analysis (which I am happy to arrange) we remain unconvinced that the storage device is anything but an LTO battery pack. I'm a chemist by training so I'd be happy to submit the cells for testing here in Perth. This is not an exercise in "shooting town the little guy who's having a go" - we're concerned that they are selling a product as something which it demonstrably isn't. Anonymous accounts set up just to defend the product raise some genuine suspicions - unhelpful at best. Sorry I couldn't be bothered reading all that. I think the difference in opinions is due to the fact that there is no common ground and not enough proof or incentive to find the truth. Given the multi-million $$ VIC funding I suspect nothing will happen until the consumer law case starts going for the multi-million $$ refund. Glad to keep things civilised. And in Coulomb's retort I again see a lot of similar inconsistencies. Plus a whole lot of coulds, maybes, perhaps's and mights. In my last post, I counted zero "could"s, zero "maybe"s, 2 "perhaps" (speculating about the extra electronics that Supercaps refuses to give any details of), and zero "might"s.
What inconsistencies did you find in my recent post? Cool - I would be relying on my connections to UWA. I presume ICP-MS to get a number on the key elements?